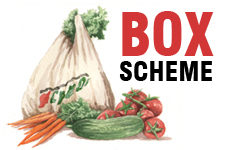 We support the development of community gardens in many different settings, from housing estates to schools and sheltered housing. 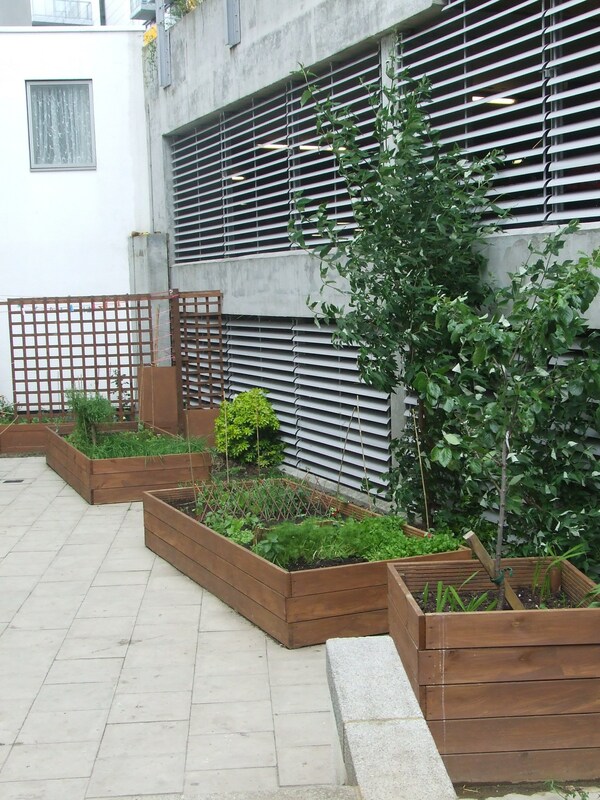 Housing association Circle 33 approached us to transform a neglected piece of land into a vibrant and greener community space. Working in partnership with Circle 33, we conducted further consultation with the residents. 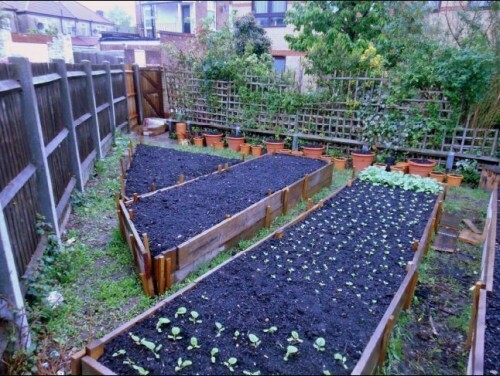 Many were keen for mini-plot style growing spaces to grow food for their family. 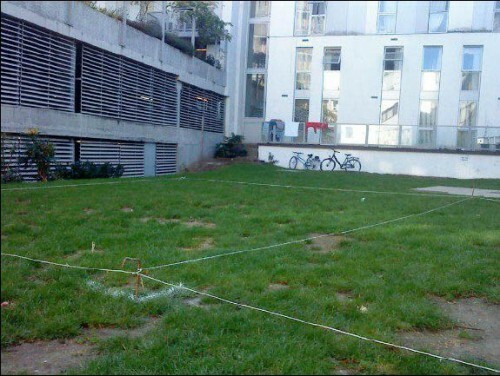 Others wanted the new design to physically break up the space to prevent noisy football games. The structures had to be sturdy to resist vandalism and protect crops from stray footballs. 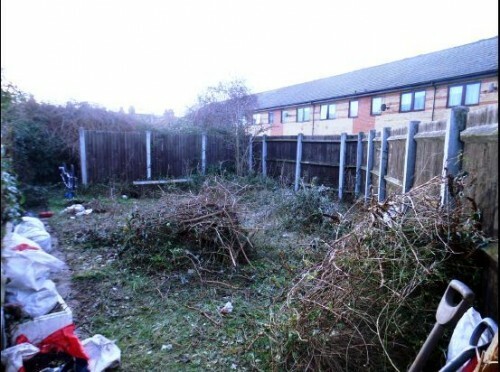 A site survey showed that the soil had poor drainage, was rubble-filled and compacted. An unknown layout of shallow pipes also prevented any deep digging. As we held a couple of workshops to involve residents in the design process, more elderly residents became interested and asked for growing spaces to be raised for ease of working. Residents’ wishes could be reconciled with the limitations of the site, and so it was decided to build up! 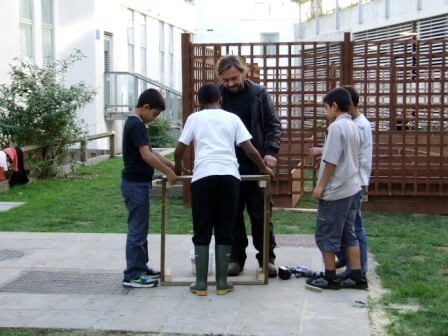 Adults, and children especially, enjoyed having the opportunity to get involved in the building process. 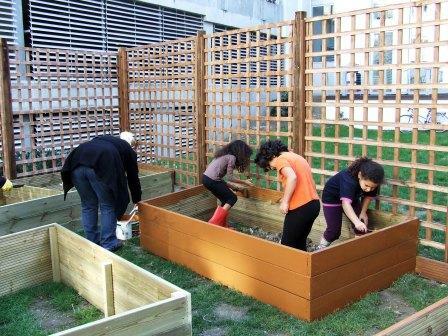 Treating timber, shifting compost and measuring… Little hands may sometimes slow the pace a bit, but we strongly believe in making space for them as it means everyone feels more ownership of the site, and less vandalism in the long term! As the construction progressed and the first raised beds got adopted and planted up, new interest began to sprout…. we were asked to go back and build more beds! Budding gardeners have emerged and while all the beds initially looked the same, individual and original styles quickly became apparent! Residents continue to grow on their plots, mostly herbs and vegetables, but also flowers and exotic plants, while the communal fruit beds carry cherries, plums and strawberries. One of our community outreach gardeners visits a few times a year to demonstrate basic techniques and answer residents’ questions. 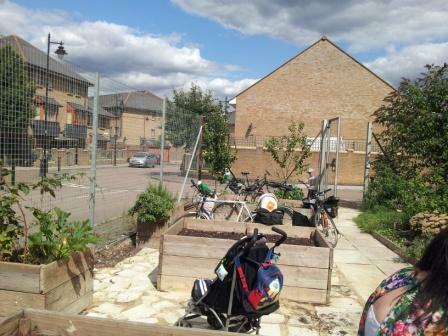 Community-Based Housing Association approached us to support transforming a disused piece of land, some of which was concreted into a community garden. 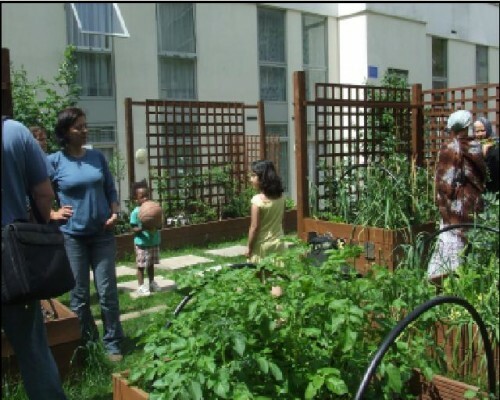 The garden was created over the whole season as series of workshops held with the local residents. 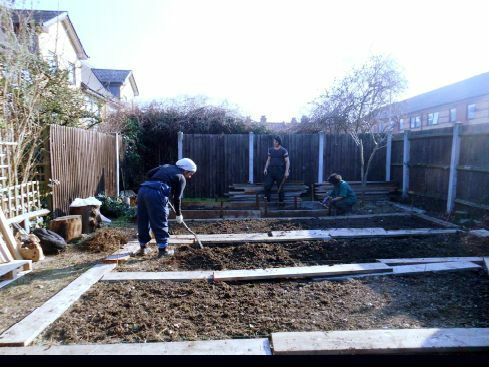 The following growing season, we ran a introductory organic gardening course in partnership with Waltham Forest Class at the garden. 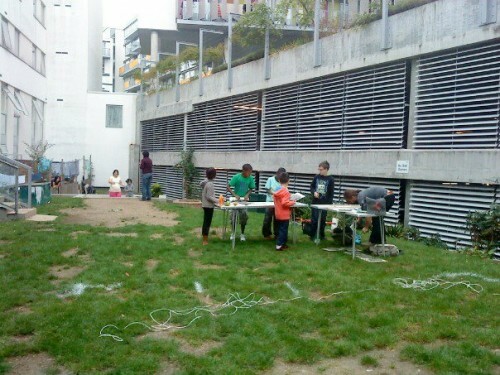 In parallel, we were also running a course Chingford children’s centre on the estate. 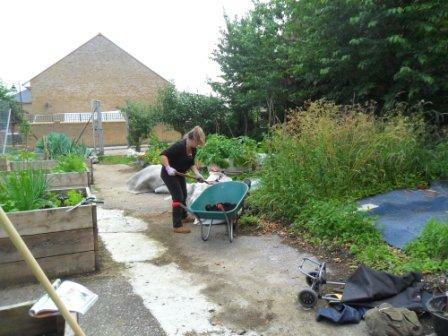 We supported linking the two groups together, creating stronger community links and greater support for the garden. The garden is still continuing as a residential-led project! Due to the poor quality of the topsoil layer, along with the availability of free local waste authority compost, we opted to grow in raised beds built with recycled scaffolding planks. 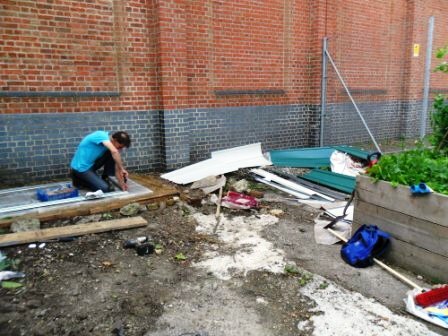 A team of local volunteers was recruited and supported by Organiclea project staff to clear the site and set up the planters. This also involved a delivery of 7 tons of compost from North London Waste, to which local residents were invited to come to collect compost for their garden. A small shed has recently been installed for storing tools and collecting rainwater – waterbutts are now to be attached. 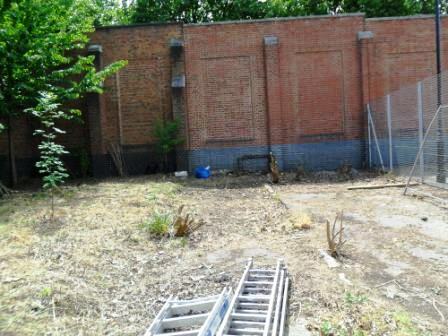 We recruited the main grower for this site among the pool of Organiclea’s trainees and volunteers. After finding his feet this season, Ben has now been paired up with another Organiclea trainee who is keen to gain experience in growing food to sell. 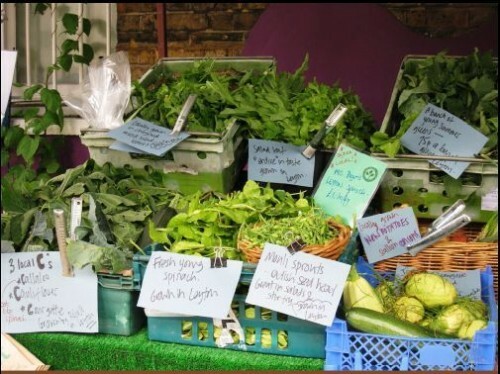 training partnership with London Borough of Waltham Forest will have the opportunity to take on a small site and apply for a ‘Grow to sell’ start-up grant. It is still early days and a more comprehensive survey will be done soon (along with a possible ‘open garden’ invitation for residents to come and enjoy cake in the garden and find out more about ways of getting involved). Informal feedback and comments have been positive; especially from those whose back gardens share a fence with the site, which – in the word of one resident, was ‘’just a rubbish dump before and now looks much nicer, especially when the vegetables were flowering.’’ One Circle 33 resident took up our offer of free compost and used it in both her back and her front garden to grow herbs and vegetables (which she was already doing in her back garden, but struggling with the poor quality of her soil). The focus – this first season – has been on growing unusual, higher value, oriental leafy vegetables such as pakchoi, shunkgiku or okahijiki. Main pests were birds, which was easily solved by the addition of protective netting. The produce was sold on Organiclea’s weekly vegetable market stall, less than 1km away from the site, through our Cropshare scheme which enables local gardeners to sell their home-grown produce through our distribution channels (vegetable box scheme and market stall). Autumn/Winter crops are currently being raised.